This listing is provided as a service to RL owners and prospective owners. If you want to buy or sell an RL, or any parts for them, click on the Add button below. To remove or edit an entry, click on the 'edit' link on the right hand side of the page. If you edit an entry, the date is updated and you go to the top of the list. If any of these listings should be removed, please send me a message. Much loved family trailer sailer �Willaroo�, setup ready for cruising, same owner for the last 35+ years, regularly sailed. Outstanding condition for the boats age, always covered. Legendary RL24 design, unmodified from class specifications. Light and very easy to handle with swing keel and rudder. Galvanised trailer in good condition, rarely used in salt water. I have decided to sell my RL28. It is thoroughly renovated with many near new components, including outboard and trailer. See my thread on QE3 in Picture Gallery. I just do not have the time to enjoy her right now and would prefer to let her go to someone who can. Email or phone me for more details, I shall list her on Gumtree for now which will include more pics. 2014 Yamaha 9.9HP 4 stroke high thrust with forward controls & electric start. Transom mount. 2 x 100 Ah LiFePo4 batteries. New. 120W solar panels with 30A Victron MPPT & battery monitor. 12V Galley pump, head sink pump. Magma solid fuel rail mount BBQ. Rocna 10kg anchor, 10m shortlink 8mm gal chain, 50m 16mm rode. 12v hydraulic keel pump with remote. Additional hank mount headsails, spare forestay. Lewmar 4:1 full width traveller. New self-tailing cockpit sheet winches. Complete deck re-fit 2018, new fittings and spinlok clutches. Fully rigged for comfortable & efficient sailing & racing. Boom tent with detachable sides. New perspex windows and forward hatch. New cushions and vinyl covers. Single handed mast raising system. Legs to allow drying out. All Cat7 safety gear and more. Current semi-laden GVM on road 2700kg. Arguably the best RL28 you will find anywhere. If you are after a high volume, safe, reliable, go anywhere trailer sailer that still sails well then this highly modified RL28 could be for you. December 2017 out of water survey available on request. Here are a just a few of the many modifications and inclusions that make this RL unique, she really needs to be seen to be appreciated. - Integrated, electric mast raising and lowering system, with remote. Can be done singlehanded whilst on the water. Refrigeration	- Huge built in Eutectic/ Ozefridge. Stove - 2 burner with grill and seperate gas bottle in a well drained locker in cockpit. Gas detector installed. Accommodation - Huge cockpit with 6ft-long seats offers plenty of room for everyone. Cockpit cushions included and integrated table. Brand new [November 2018] high density cushions covered in marine grade cloth and marine carpet throughout. The cabin offers full standing headroom and very comfortable accommodation. The dinette seats four comfortably and the table can be dropped to create a large double berth. The large (2.4m long) sofa to port provides another single berth. The cabin itself will easily seat 8 or more people. Berths- Double forward in v birth, double to Stbd in saloon and single to Port. Single quarter birth port aft. Toilet- Electric macerating with holding tank. Also has a french style Bidet which can be used with either fresh or seawater. Covers- Bimini cover shades cockpit and stows neatly for towing. Headsail and main covers. Ground tackle - 7.5KG Bruce with 40m of 10mm chain and rope. Muir electric windlass. Fire Protection - 2 x fire extinguisher and blanket. New 2018 Epirb. Electrics - 2x new 130AH AGM house batteries  1x 100AH start battery. 80W solar panel. Built in CETEK charger and shore power. Loads of power ! Wired for 240V shore power with 240V socket in cabin. Electronics - 2x Garmin GPS, Speed, depth. Hummingbird fish finder. Clipper wireless wind, speed, direction. Ipad mounts. Raymarine ST100 Autopilot with remote. Sail inventory - 2x kites, 1x Drifter, storm, trysail, headsail all in good condition. Furling genoa with Furlex S50 furler. Tiller steering with a swingable drop rudder. Twin axle trailer with electric over hydraulic brakes. Huge electric trailer winch. Led lights etc. All in excellent condition. Last anti fouled November 2017. Great boat only selling because we've bought a bigger one. We are after an RL28 or RL34 for family cruising. Downshifting from a Crowther 10m cruising catamaran on hard stand in Mackay qld. Keen to talk about purchase or part-trade. Need a second hand swing keel for RL24 Mark 1 Mine is rusting and has been in Ruby Jay since birth. Had a look at the keel when she went over. Not pretty. 1988 RL28 set up for single handed. Totally refurbed trandem (mid '18)mast head rig with furler, new main(1 season)L/jacks+bag,#1,2+storm jibs. Electric start 15hp honda in well with new high-thrust prop and bomb-bay doors.Twin 20ltr fuel tanks with water trap-filter. 200ltrs water in 3 tanks with electric pump. As new porta-pottie (used once)VHF radio with mast-hd aerial.Able to re-rig original 3/4 forestay in miutes using hy-feild lever. s/s maxie twin-burner metho stove with grill. New 12v hydaulic pump for keel(not fitted). Dagger blade rudder. This boat has never been anti-fouled and has been kept in a shed for all but the last 5years of its life. Registered boat and trailer 4 stroke 5hp that charges 130amp hour battery plus two solar panels method stove radio GPS nav sail number 303 I believe is 81 model cushion and carpet in side set up for a second battery 50ltr water tank on board. RL24 Mark 3 Swing keel. One main, 2 jibs, one spinnaker. RL24 mast. 6 HP and 3.5 HP 2 -stroke Johnson outboards - both in excellent condition. 25 litre fuel tank. New fire extinguisher. Cushions for 4 full length bunks. Chemical toilet. Boarding ladder. New bearings, tyres and brakes on single axle galvanised trailer. Ready to cruise or race. RL24 Mk3 " Remedy". Set up for cruising. Swing keel. Large s/s targa bar (has roller for mast raising) makes getting on and off easy. Twin gin pole system for mast raising. Electric winch for keel. 100 amp hr battery. Standard RL mast. Main,jib,furling jib,spinnaker ( no pole ). Marina 8 hp. Large plough anchor - never lets go. Single axel trailer. Spare wheel.Trailer serviced 13/12/2018. Rego to 2/2019. Boat Reg to 10/2019. All in good condition , except some paint peeling. Hydraulic Specialist pump to suit RL28 keel pump. Recently overhauled, new pistons manufactured and cylinders re-bored. Free to a good home, pick up or buyer pays postage. Located in Lake Macquarie, NSW. No longer required as went 12v DC powered pump. Price: Free to a good home! Extremely rare Rob Legg 14'catamaran "Sea Leggs". A man needs a project! Bring this classic beauty back to life and be the toast of the RL community. This boat is ready to race! I looking to buy a new/seconded hand rudder for an RL24. Trying to get my old RL24 ship-shape for the nationals in 2019. Please send me a personal message if you have any ideas. RL 24 in good condition.Has not been used much in the past few years. Same owner since 1980. Has 1984 Cox trailer that can be repaired. Mark 1, main jib 3 spinnakers, bunk cushions, floorboards with carpet, 2 burner ss metho stove, radio, gel battery, ground tackle with chain, porta pottie (never used), small solar panel, spares etc. 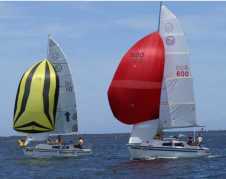 This boat is set up for racing and has won numerous events but can also be cruised in comfort. RL24, Purchased 10 years ago, was restored and had new trailer (which is still in very good condition, registered, but brakes need attention). Have had great use and a lot of fun, but unfortunately not getting used. Could do with a clean and tidy up. Hull is solid. Boat is located at Wendoree Park, 45min noth of Sydney. Wanted - Bow rail for an RL 24. RL 24 for sale. SPUD GUN is a racer. No fit - out. Look on Boat Sales web site. Its a great RL community especially if you do the Nationals. The boat is available for charter. Nationals are on in January 2018 at Lake Illawara. You need to let me know by Christmas Day.